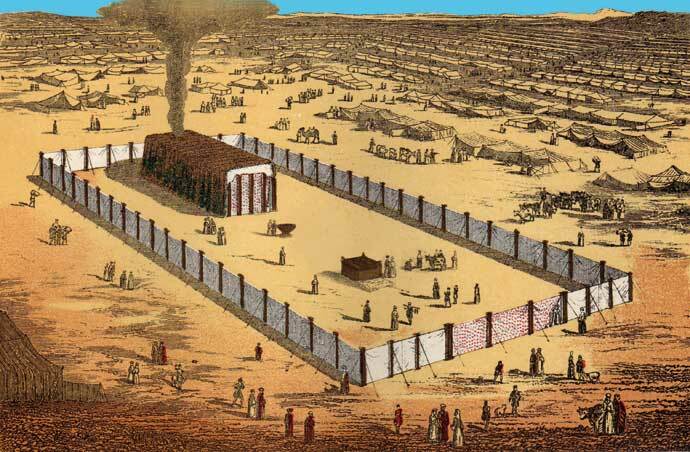 The tabernacle was the Lord’s dwelling place among His people. Everything in the tabernacle was made according to the pattern Moses was given in a heavenly vision on the mountain. No part was left to chance and every detail was directed by the Lord. Why would the Lord give such comprehensive and elaborate instructions? What was the meaning of these circumstantial directions? The Lord has always wanted to dwell among His people. Under the old covenant every detail had to be correct for human beings to draw near to God. Every aspect of cleansing and atoning sacrifices was important to make it possible for fallen men to meet the Holy and Almighty. Now all these things happened to them as examples, and they were written for our admonition, upon whom the ends of the ages have come (1 Cor 10.11). …who serve as a copy and a shadow of the heavenly things, as Moses was divinely instructed when he was about to make the tabernacle. For He said, “See that you make all things according to the pattern shown you on the mountain” (Heb 8.5). The tabernacle of the old covenant speaks prophetically about the realities of heaven, and these truths are of utmost importance to understand the kingdom of God. The detailed descriptions of the tabernacle are given to instruct us about spiritual realities and the heavenly realm. Without any understanding of the symbols of the old covenant, we will not properly understand the truths of the kingdom. The Lord wants His people to know Him. He will dwell among us and reveal His presence. The tabernacle represents His reign in heaven and existence in this world. The whole concept of church is about building a dwelling place for the Lord. We are not called to build large organizations or wonderful cathedrals, but we are called to be the tabernacle and the temple of the Lord. He wants to dwell in human vessels and reveal His glory through us. This is almost incomprehensible to the human mind, but He has chosen to be in our midst. Every detail of the tabernacle has a prophetic message to us about His presence and the revelation of his power and glory. The church is His dwelling place, a holy tabernacle for the Lord. Anything else is not His church. We are His church to the degree that He indwells it. We are nothing more than a human institution or a worldly organization if we lack His presence and the anointing of His precious Spirit. The offerings of the tabernacle speak about the blood of Jesus. Everybody and everything in the church need to be covered by the atonement of Jesus. 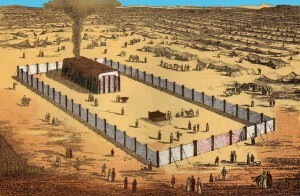 We may learn a lot about the power of His blood by studying the instructions about the tabernacle. The use of sweet incense every morning and the perpetual incense before the Lord is a strong prophetic image of praise and prayer before the throne of God. Bezalel was filled with the Spirit of God “in wisdom, in understanding, in knowledge, and in all manner of workmanship, to design artistic works, to work in gold, in silver in bronze, in cutting jewels for setting, in carving wood, and to work in all manner of workmanship” (Ex 31.3-5). And the Lord had “put wisdom in the hearts of all the gifted artisans” to make all that He had commanded for the tabernacle (verse 6). We can not build a dwelling place for the Lord unless we are filled with the Spirit of God. We need the Lord’s wisdom in our hearts to build the church. Ministry in the Lord’s church must be born and anointed by the Spirit. And you shall make from these a holy anointing oil, an ointment compounded according to the art of the perfumer. It shall be a holy anointing oil (Ex 30.25). The holy anointing oil is a symbol of the power and presence of the Holy Spirit. We should notice the importance of anointing oil in the old covenant because all this ”happened as examples” so that we may understand the importance of the Holy Spirit under the new covenant. The altar of burnt offerings with all its utensils, and the laver and its base. You shall consecrate them, that they must be most holy; whatever touches them must be holy. And you shall anoint Aaron and his sons, and consecrate them, that they may minister to Me as priests (Ex 30.26-30). Everything in the tabernacle needed the anointing for the service to the Lord. Even details as the utensils of the table and the altar had to be anointed. The oil consecrated everything to the Lord and made them holy as the Lord Himself. Aaron and his sons were not allowed to minister without the anointing. Why did the Lord pay such attention to the oil? He has been looking forward to the day when He could anoint all His people with the power of the Holy Spirit. He wants us to understand the value and importance of the anointing of the Spirit. Pentecost was not only a new beginning. It was the day when God started to pour the holy anointing oil from heaven on all flesh. This was not possible under the old covenant. On the contrary the Lord said that the oil “shall not be poured on man’s flesh” (Ex 30.32). But the perfect sacrifice of Jesus opened the gates of heaven and let the holy anointing oil flow to all who will receive. The oil is free, but not less precious. The instructions regarding the old tabernacle teach us that nothing in the world is more sacred and valuable than the holy anointing oil from heaven. Just as the oil was a presupposition for the old covenant ministry, the anointing of the Holy Spirit is necessary for new covenant ministry. Unfortunately we tend to disparage the significance of the anointing for the benefit of human ingenuity, oratorical skills and administrative ability. But these human qualities were of no value to the tabernacle without the holy anointing oil, and they will not produce any eternal fruit for the kingdom today unless we are anointed by the Holy Spirit. I am the vine, you are the branches. He who abides in Me, and I in him, bears much fruit; for without Me you can do nothing (John 15.5). We are the branches of Jesus. We desperately need His life and power to bear fruit. We may be dry and still connected to the trunk, but unless the sap of His spirit flows through us, we bear no fruit for His kingdom. We may still be busy managing all our Christian projects and ecclesiastical activities, but without His anointing we are not producing anything of eternal value. The Holy Spirit is not less important to us than the oil was to tabernacle! If the priests were dependent on the anointing under the old covenant, our need for the anointing of the Holy Spirit is even greater. We rebel against the Lord when we try to manage spiritual ministry independent of Him. We like to be in charge of our own business and unconsciously we try to produce fruit independent of the vine. But experience in ministry does not give authority to teach, preach or lead without seeking the Lord for wisdom and anointing on every specific occasion. He does not want us to become legalistic in our quest of the anointing, but we must acknowledge that He is our source. We are totally dependent on His wisdom and power to serve in His kingdom. The Lord loves us and wants to be with us. The anointing is the presence of God. He does not want anything in His church to be separated from Him. This is the reason that everything in the tabernacle had to be anointed with oil. We desperately need the anointing of the Spirit in our churches. The preachers and worship leaders must be anointed to impart the power of the kingdom to the church. But the anointing is not less important for the Sunday school classes, children’s ministry, prayer groups, work among the young people, outreach ministry or even for those having practical functions such as serving meals. In the first church the apostles looked for “seven men of good reputation, full of the Holy Spirit and wisdom” to serve tables (Acts 6.2-3). David knew that he needed a clean heart and a steadfast spirit to serve the Lord, and his greatest fear was to be cast away from the Lord’s presence and lose the anointing of the Holy Spirit. Nothing was more valuable to David than the presence of God. Under the new covenant we may all be anointed like David. We are not kings, but we are children of the King of Kings. We are called to live in His presence. Once we have experienced the mighty anointing from the Lord, we become desperate without it. Nothing in the world is more thrilling than experiencing the manifest presence of God. The feeling of His presence may be so strong that ministering without the anointing feels more like a nightmare. We may become totally addicted to the power and presence of the Lord. The Lord will cleanse His temple and fill us with glory. We should not be ignorant about His zeal for His house, we are called to be cleansed in His blood and a vessel for His anointing. When Jesus made a whip and cleansed the temple in Jerusalem, this was a profound statement about the Lord’s willingness to drive out everything that is not of Him in us and replace it with glory. What we have made a house of merchandise, He will change to a house of prayer and power. He is more than willing to change His church when we let Him cleanse, fill and anoint us. ‘and I will shake all nations, and they shall come to the Desire of All Nations, and I will fill this temple with glory’, says the LORD of hosts. ‘The silver is Mine, and the gold is Mine’, says the LORD of hosts. ‘The glory of this latter temple shall be greater than the former’, says the LORD of hosts. ‘And in this place I will give peace’, says the LORD of hosts” (Haggai 2.6-9).